Vincent Feigenbutz (21-1, 19 KOs) and his opponent Giovanni De Carolis (23-6, 11 KOs) both performed a public workout today ahead of their vacant WBA World Super Middleweight title fight on Saturday night at the Baden-Arena in Offenburg, Germany. In front of close to 800 spectators at the famous Europa-Park amusement centre in Rust, the battling super middleweights took to the ring to give fans an indication of what they can expect from their hotly anticipated World Championship rematch. ‘’The time for talking is almost over,’’ said the 20 year-old Feiegnbutz, who can become Germany’s youngest ever World Champion with a second victory over De Carolis. ‘’Now, I must show everybody what I can do in the ring! 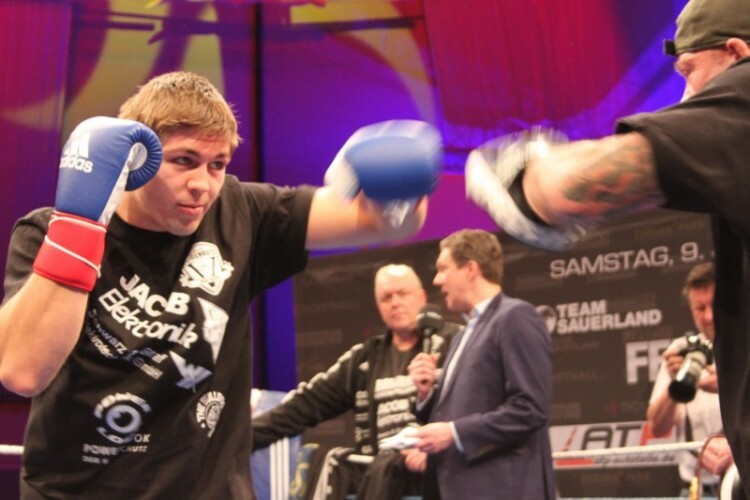 Also present at today’s public workout were rising German stars Leon Bauer (5-0, 4 KOs), who at seventeen years of age is the country’s youngest professional boxer, and 21 year-old heavyweight Alexander Hofmann (1-0). Both are in action on Saturday night, with Bauer taking on the undefeated Ondrej Marvan (3-0, 2 KOs) and Hofmann searching for a second professional win against Bekim Pagga (5-8, 3 KOs). Limited tickets for the WBA World Super Middleweight Championship fight between Vincent Feigenbutz and Giovanni De Carolis are available online via www.eventim.de and www.tickethall.de or by calling +49 (0) 1806-570044. Vincent Feigenbutz (21-1, 19 KOs) can write boxing history on Saturday night by becoming Germany’s youngest ever World Champion with the vacant WBA World Super Middleweight title now on the line in his rematch with Giovanni De Carolis (23-6, 11 KOs) at the Baden-Arena in Offenburg, Germany. Feigenbutz and De Carolis were originally scheduled to contest the WBA’s interim World title, but yesterday, the governing body announced that their fight will be for the ‘regular’ World title. Their ruling comes following Andre Ward’s move up to light heavyweight and the subsequent promotion of World Champion Fedor Chudinov to Super Champion. The WBA’s decision adds even more significance to the hotly anticipated rematch between Feigenbutz and De Carolis, in which both boxers are eager to settle the score following their fiercely contested first encounter. It also means that Feigenbutz, at just 20 years of age, can become Germany’s youngest ever World Champion, beating the previous record of Graciano ‘Rocky’ Rocchigiani, who was 24 years old when he first claimed World honours. Tickets for the WBA World Super Middleweight Championship fight between Vincent Feigenbutz and Giovanni De Carolis are available online via www.tickethall.de and www.eventim.de or by calling +49 (0) 1806-570044.